A cigarette is a cylindrical roll of shredded or ground tobacco that is wrapped in paper or another substance that does not contain tobacco. Many manufactured cigarettes also have filters on one end that are intended to trap some of the toxic chemicals contained in cigarette smoke. Depending on the type of cigarette, the ingredients will vary somewhat. Commercially produced cigarettes manufactured by one of the Big Tobacco companies can and do contain hundreds of additives on top of the tobacco that's in the cigarettes. Some additives are used as flavoring agents, but others, like ammonia, are added to boost the effect that nicotine has on the smoker. Additives are also used to do things like keep the tobacco moist and extend shelf life. In April of 1994, five of the big tobacco companies in the United States provided the U.S. Dept of Health and Human Services with a list of 599 potential additives used in manufacturing their cigarettes. They were required to do this because of a Federal court ruling. In June of 2009, the Family Smoking Prevention and Tobacco Control Act was passed, placing requirements on tobacco companies to report all ingredients used in cigarettes and other tobacco products. This includes amounts used in individual "recipes". New products must be submitted for approval before going to market. Hand-rolled or roll your own cigarettes use loose tobacco. They don't contain all of the additives that traditional cigarettes do, but they are hazardous to health, as well. Cigarette smoke is a complex mix of more than 7000 chemicals. Some are produced by the additives listed above, some from pesticides that are used in the tobacco farming process, some are formed when those additives are heated and/or burned, and some are formed when burning chemicals combine, producing yet more unique chemicals. To date, 250 poisonous chemicals have been identified in cigarette smoke, and 70 carcinogens. How Long Have Cigarettes Been Around? Mayan Indians may have been the first people to smoke tobacco in the Americas. Images of tobacco use have been found carved into stone that date to 600 to 900 A.D. North American Indians have long smoked pipes filled with tobacco as part of religious ceremonies and medical purposes. Smoking was not a daily activity, rather, it was filled with special meaning. Cigarette smoking became a popular activity with men in the early 1900's, but it wasn't until World War I and World War II that it really took off. Cigarette companies gave soldiers free cigarettes and marketed them to women back home as well. By 1944, cigarette manufacturing was a 300 billion dollar industry. At that time, servicemen consumed approximately 75 percent of the cigarettes produced. By 1964 however, concerns over the health effects of smoking were surfacing. 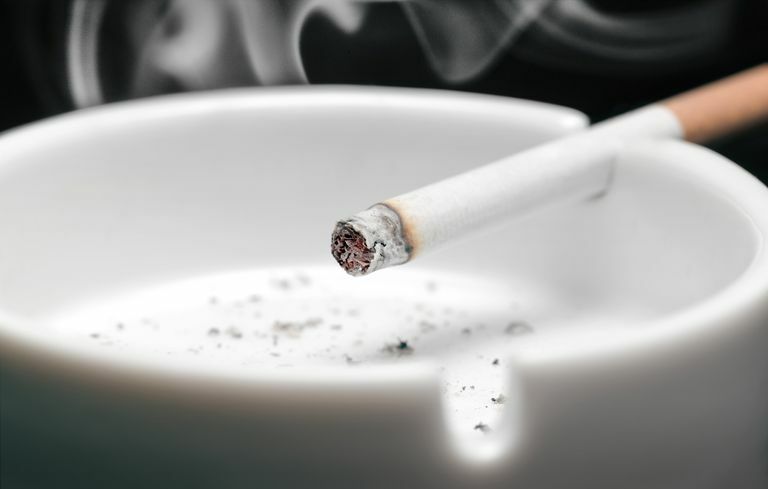 The U.S. Surgeons General published a report about the dangers of smoking and not long after, Congress passed the Cigarette Labeling and Advertising Act. It said that every cigarette pack must have a warning label on its side stating "Cigarettes may be hazardous to your health." Today, cigarette smoking is on the wane in many parts of the world, but plenty of cultures still smoke with few, if any legislative restrictions on them. It's likely that cigarette consumption will continue to decrease as more and more people understand the tremendous health hazards they pose. Healthliteracy.worlded.org.From the First to the Last Ash: The History, Economics, and Hazards of Tobacco.